The timber wolf (Canis lupus), also known as the gray wolf, is a wild canine that has a fierce and ominous reputation. Despite their general public image, timber wolves usually stay far away from people, although the same can't be said about their approach to many other earthly creatures, from reindeer to rabbits. Although timber wolves are often called "gray" wolves, they aren't always gray. For the most part, they are brownish-gray in coloration, with some yellowish-beige elements to their underbellies and faces. However, they also frequently have black, brown and white fur. Their bodies are typically between 3 and 5 feet in length. Males are often significantly heftier than females, usually weighing between 70 and 145 pounds. The female weight range is usually between 60 and 100 pounds or so. Timber wolves are similar, physically speaking, to domestic canine breeds such as malamutes and German shepherds. Wolf packs generally consist of five to nine specimens. Their reproductive season takes place during January and February. In history, timber wolves had the distinction of being the animal species with the single widest geographic range, indicates the IUCN Red List of Threatened Species. That's no longer true, as the wolves no longer exist in many parts of both North America and western Europe. Although these canines are absent from large fractions of their former grounds, they still live in quiet sections of Canada, Alaska, Asia and Europe. Some of the other nations that make up the timber wolf range are China, Germany, Romania, Greenland, France and Armenia. In the United States, timber wolves live only in a handful states, including Michigan, Wisconsin, Montana and Alaska. Although timber wolves often reside in silent environments far from human settlements, they are versatile in their choices of habitats. Timber wolves are often found in taigas, prairies, forests, tundras, brushlands, grasslands, mountains and deserts. On the whole, timber wolves are extremely adaptable creatures. If sustenance abounds, then timber wolves are usually able to make do -- but only in northerly climates. 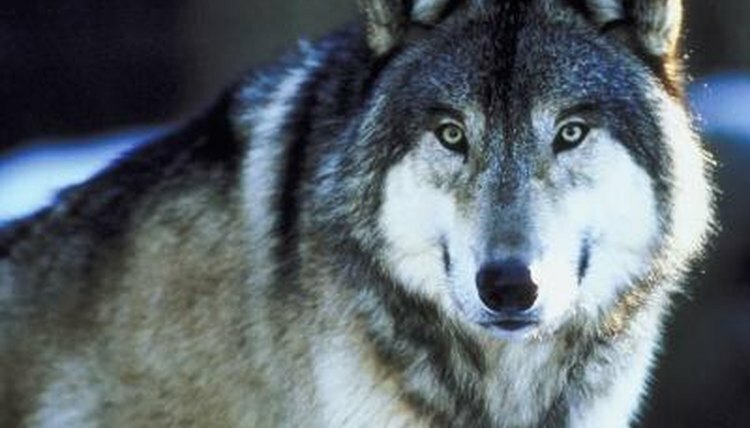 Timber wolves are carnivorous animals and frequently feed on musk oxen, bison, elk, beavers, moose, wild boar and caribou. They also occasionally consume the rotting remains of dead animals. Timber wolves sometimes rummage through garbage cans on quests for meals.